Throughout social services, geographic information system (GIS) mapping software has been used to support and improve research, planning, and advocacy efforts. But even with such demonstrated value, GIS has experienced limited uptake, largely due to a lack of training and a lack of accessibility. 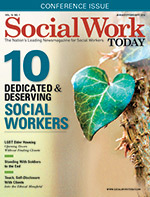 In order for the software's potential within social services to be fully realized, these issues must be addressed, with direct involvement from social workers in both teaching and using the tools. GIS software is used to create a wide variety of maps, which can then be used for research, analysis, and information sharing. In addition to comparing data from different geographical regions, the software can be used to combine multiple data sets from different sources through the use of map layers. This makes it possible to identify patterns and correlations between seemingly disparate data elements, revealing relationships that might otherwise go unnoticed. While much of the growth in GIS use is relatively recent, the practice of mapping for research and advocacy purposes dates back much earlier. Of particular note is the early mapping work of social worker and activist Jane Addams, who coauthored Hull-House Maps and Papers. Published in 1895, this essay compilation included maps showing demographic details about the immigrant groups living in the vicinity of Hull House, a Chicago settlement house. Addams' work was highly influential in establishing mapping as a tool for social and demographic analysis. The use of maps in social services has progressed considerably since that time, with GIS software increasing the capacity for data integration and analysis. A major difference between a traditional paper map and a GIS digital map is the latter's dynamic nature. Through the use of interactive features, digital maps provide enhanced usability by allowing users to actively engage with the data. County Health Rankings & Roadmaps, a collaborative project between the Robert Wood Johnson Foundation and the University of Wisconsin Population Health Institute, uses a series of interactive maps to compare health factors between counties. The maps show all the counties in each state and their rank in various health measures (eg, length of life, quality of life). Users simply move their cursor over the map to get a pop-up box providing the name of the county and its rank. Compared to viewing the same data in a list or spreadsheet format, many users prefer this dynamic, interactive presentation. Sarah Elwood, PhD, is a professor of geography at the University of Washington. Elwood's research reflects how GIS-based spatial knowledge can be used to identify, analyze, illuminate, and help solve a variety of social issues. She is also a cofounder of the Relational Poverty Network, a collaborative network focused on expanding poverty research. Elwood believes GIS and spatial mapping are a valuable complement to social workers' existing tools, and she encourages GIS use as part of a broader strategy. "When it comes to addressing social disparities and structural disadvantages," she says, "social work practice needs to incorporate a holistic and multifaceted approach, so additional tools are always helpful." Elwood believes that mapping data can be useful when making a case for funding or presenting an appeal to elected officials for policy reform and legislative changes. Using maps can make the presentation of data clearer, helping to legitimize the data and make them more authoritative. This can be especially valuable for any organization trying to form a compelling argument for increased funding and resources. The Centers for Disease Control and Prevention (CDC) provides a wide variety of maps precisely for this purpose. The CDC's Chronic Disease GIS Exchange is an online forum where public health professionals and community leaders can access maps and learn about GIS use to enhance chronic disease prevention and treatment. These maps can be used to support policy-related activities, collaboration efforts, and to document disparities in chronic diseases. Practitioners can use the maps to visually highlight "hot spots" where particular issues are intensified, and to support recommendations and proposals around service needs. Data are compiled from multiple sources, allowing the gallery of maps to cover a broad range of health determinants. The foster care system is another area where GIS has been used to identify needs and inform service delivery. For example, foster care first-entry incidence rates across a county or state region have been categorized and mapped based on ZIP code. The resulting maps make it possible to identify not only which ZIP codes have the highest first-entry rates of foster care placement but also where those ZIP codes are clustered within the region. With this type of information, resources can be allocated to better meet community needs. Another application of GIS is asset mapping, in which relevant community resources such as health care, shelter, immigration services, etc., are identified and mapped. An asset map provides insight into the availability, distribution, and accessibility of both formal and informal assets, allowing service providers to identify strengths and gaps within the community. This allows advocacy and community development efforts to be targeted for maximum benefit, and existing resources can be better utilized to support the well-being of community members and solve community problems. Amy Hillier, MSW, PhD, is a professor at the University of Pennsylvania School of Design, where she teaches courses related to both GIS and social work. Her research focuses on issues of geographic disparities and access to services and resources in disadvantaged communities. She outlines the many benefits of GIS to social work in her paper "Why Social Work Needs Mapping." Hillier believes most social workers today aren't aware of all the ways GIS software can support their day-to-day work, with this lack of awareness being part of a larger issue involving all types of technical training. "More generally, social work programs have not focused on the importance of computing skills to professional practice," she explains. In spite of the overall lag in technical focus within social work programs, there have been efforts to integrate GIS software into the social work course content at some postsecondary institutions. But the success of these efforts rests in part on who is doing the teaching. "In order for GIS to become integrated with social work teaching, we need social work faculty who can teach GIS courses," Hillier advises. She points to a need for GIS to be introduced in social work practice classes and highlighted in continuing education programs in order to increase awareness and effectively penetrate the field. The value of GIS and mapping in social work might seem self-evident, given the profession's "person-in-environment" perspective. However, a change in approach may be necessary to fully support the integration of GIS with social work teaching beyond the macro level. "Much of social work teaching is still dominated by faculty with a clinical perspective," Hillier explains. "We have to move beyond an either/or approach and see that good clinical practice and person-in-environment/systems thinking are complementary." For many nonprofits and social service organizations, limited funds and resources present an ongoing challenge to GIS use. Even when organizations are aware of the ways in which GIS and spatial analysis might be beneficial, they are often limited by a lack of appropriate skills and resources. The good news, according to Elwood, is that advancements in GIS technology have led to greater availability and more accessible tools. The GIS landscape has evolved significantly, and there are more options available now both in terms of GIS software and training. "When I started in this work 20 years ago," Elwood says, "the mapping software available cost thousands of dollars and took months to learn. The barriers to entry for map making and spatial data collection are much lower now, due to all the free and low-cost resources that are available." She cautions, however, that the digital divide has not been done away with entirely; there are still challenges. For instance, free and low-cost mapping tools may be more complicated to use and less powerful in terms of features and capabilities. While GIS may offer far-reaching capabilities for mapping and spatial analysis, the human element with respect to using these tools can't be overlooked. It's inevitable that the competencies, perspectives, and values of GIS users will influence outcomes, making it essential that social workers be actively involved in GIS collaborative efforts. "These mapping technologies are only as useful as the robust collaborative human process that they're embedded in," Elwood says. Hillier provides an important reminder that the origins of GIS technology are in the defense industries; therefore the application of GIS in social work practice differs from its use in other contexts. In light of this reality, it's critical that social workers be directly involved in the mapping process in order to achieve meaningful outcomes. "The maps that social workers make—or would make if they knew how to use GIS—are different from what professionals in other fields map," Hillier says. "If we want to see our values, our questions, and our data reflected in GIS maps and spatial analysis, we, the social workers, need to be the ones to make them."